TVNewser has the story of American Morning Entertrainment and Culture Correspondent Lola Ogunnaike leaving CNN today. Her contract was not renewed. As of now her photo is still at CNN.com/anchors and CNN.com/AM. Best of luck to her in the future! Following last year’s successful Black In America documentary series, CNN will turn its cameras on America’s Latino community with the two-part documentary series Latino In America premiering in October. Celebrating his 20 years of incredible reporting for CNN En Español, the network will present a special program titled Testigo de la Historia (Witness of History), which will showcase the most important news stories of his career. He will provide a personal view of these events during this program. It airs Thursday, June 11 at 9:00 ET on CNN En Español. 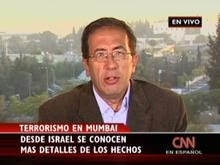 Levy has covered mideast events from CNN's Jerusalem bureau for CNN En Español since 1998. He is the network's most veteran correspondent. Levy obtained the only interview with Cuban President Fidel Castro on the day of his first meeting with Pope John Paul II in Rome. He holds an undergraduate degree from the Universidad Central de Barcelona and a Ph.D.from the University of Jerusalem. CNN Business News Correspondent for HLN's Morning Express with Robin Meade, has moved to Atlanta. She is now the only correspondent for CNN Business News based in Atlanta. Results released today by the Global Capital Markets Survey (GCMS) show that in difficult economic times senior bankers, chief financial officers and treasurers at the world’s largest organisations are tuning in to international television for their fix of up-to-the-minute news and information. GCMS represents two distinct types of respondents: those working in the world's largest organizations - the capital borrowers; and those working for banks and financial institutions - the capital lenders. The survey reports CNN International takes the top spot, ahead of news channels BBC World, CNBC and Bloomberg as the leading news brand for the global financial community, across all regions (Europe, Middle East, Africa, Asia-Pacific, Latin America and North America). According to Global Capital Markets, 85% of those surveyed watched international television four weeks preceding the survey and 69% had tuned in to international television in the seven days leading up to the survey. 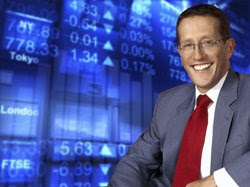 The results validate international television as the medium of choice for corporate financial professionals who have a direct hand in raising capital and trading the markets during the recession. “In tough times when market confidence is low, these results speak volumes from an audience who are key financial influencers and play an integral role in keeping the global economy ticking over. The main message for advertisers is that to reach this elusive audience of finance heavy-weights, CNN delivers that promise better than any other network”, said Jonathan Davies, Executive Vice President Ad Sales, CNN International. Across Europe, the Middle East, Africa, North America and the Asia-Pacific region, CNN leads its closest competitors BBC World, CNBC and Bloomberg in monthly, weekly and daily reach, cementing its position as the number one news brand across each region. Globally, 73% of financial management in the world’s 2000 largest organisations tune in to CNN each month, positioning the network 20 percentage points ahead of its nearest rival, CNBC (CNBC 53%, Bloomberg 45%, BBC World 45%). At 57%, CNN’s weekly reach ranks 17 percentage points higher than its nearest rival CNBC; the network also leads the field in daily reach. Amongst the senior management of banks and financial institutions, CNN ranks as top choice, exhibiting a clear lead over the competition in all three measures. CNN connects with 72% of senior bankers on a monthly basis (Bloomberg 55%, CNBC 53%, BBC World 53%), 54% weekly (CNBC 41%, Bloomberg 39%, BBC World 36%) and 29% daily (CNBC 23%, Bloomberg 21%, BBC World 16%). As today’s financial professionals increasingly look to online for the latest news and information, CNN records similar success with its branded websites. Combined, CNN.com and CNNMoney.com (24%) rank second only to Bloomberg.com (38%) in terms of popularity amongst survey respondents, ahead of Reuters.com (23%), FT.com (22%) and WSJ.com (20%). “We have a growing portfolio of banking and finance clients including Zurich, ING, Deutsche Bank, Barclays Capital and Qatar Financial Centre who continue to advertise with us across both web and TV”, added Davies. “Our cross platform results are an acknowledgement that we’re getting it right for the financial audience”. The GCMS Survey provides data on TV viewing, website usage and readership among CFOs and senior financial decision makers in the world’s largest organisations, and among top managers of financial institutions, commercial and investment banks. Conducted by Think Media Consultancy, with a global universe representing 9756 individuals in 33 countries, the fieldwork was carried out between October 2008 and March 2009. Latino In America - Coming This October! LATINOS ARE CHANGING AMERICA AND AMERICA IS CHANGING LATINOS. The Latino population is America’s largest minority and is projected to nearly triple by 2050. Latino immigrants come from at least 20 different countries. They’re not one race or one color. They don’t have a single religion. They fly the stars and stripes and the flag of their home country. Some struggle with English, others don’t speak Spanish. There are literally hundreds of ways to describe being “Latino in America.” However defined, the sheer number of Latinos is shaking up America, reshaping schools, churches and neighborhoods. Latinos are forcing a nation of immigrants to rediscover what it means to be American. This October, CNN’s portfolio of news brands and its Award winning documentary unit to report on Latinos in America like no other new organization can. Soledad O’Brien will take viewers inside this complex, dynamic community for a comprehensive, in-depth look at how Latinos are changing America and how America is changing them. This four-hour special will air late October. CNN, HLN, CNN.com and Essence Communications, Inc., today announced a partnership to develop What Matters, a series of weekly news segments focused on issues of importance to the African-American community. As an extension of the regular news items and features in ESSENCE magazine, as well as the ongoing multicultural programming on CNN, the on-air and online segments will be hosted on CNN by Tony Harris and Don Lemon with contributions from Roland Martin, Fredricka Whitfield and T.J. Holmes. The segments will be hosted on HLN by anchor Richelle Carey. The recurring segment debuted on CNN on Friday, May 8, in the 12 p.m. hour and will feature topics ranging from 401(k) strategies to elder-care issues to pop culture. On HLN, the segment will be seen during the 6 p.m. hour on the Friday, Saturday, and Sunday editions of “Prime News.” Inspired by the monthly “Our News” section of ESSENCE magazine, content for the segments will be developed collaboratively. Online users also can view the “What Matters” segments on-demand at CNN.com and on Mondays via CNN.com Live, the Internet's only live multi-stream video news service. This online content will be available beginning May 15. In addition, Essence.com will offer users related articles, additional commentary, blog discussions and the opportunity to view the “What Matters” segments. What Matters is sponsored by McDonald’s, who is also the presenting sponsor of CNN’s Black in America 2, the sequel series to 2008’s groundbreaking initiative. Reported by CNN anchor and special correspondent Soledad O’Brien, Black in America 2 reveals the stories of community leaders and innovative pioneers who are creating solutions to challenges within African-American communities – closing achievement gaps in education, reducing health disparities, and launching business enterprises. The two primetime documentaries for the series premiere on Wednesday, July 22, and Thursday, July 23. The 2009 co-production with Essence Communications, CNN & Essence: Reclaiming the Dream 2, will be filmed on July 4 at the Essence Music Festival in New Orleans. HLN, a division of Turner Broadcasting System, Inc., a Time Warner Company, is designed especially for viewers who want relevant and comprehensive news and personality-driven programming in a way that suits the urgency of their schedules. Via its “news and views” format, the network updates viewers constantly, 24 hours each day, with complete and concise national newscasts throughout the day and a compelling slate of legal, entertainment and talk programs during at night, utilizing the best resources of CNN Worldwide. Essence Communications Inc. (ECI) is the leading media and communications company dedicated to African-American women. With a multi-platform presence in publishing, live events, and online, the Essence brand is “Where Black Women Come First”. The company’s flagship publication, ESSENCE magazine, is the preeminent lifestyle magazine for African-American women; generating brand extensions such as the Essence Music Festival, Women Who Are Shaping the World Leadership Summit, Window on Our Women (WOW I & II) and Smart Beauty I, II & III consumer insights, the Essence Book Club, Essence.com, and ventures in digital media (mobile, television and VOD). For 38 years, ESSENCE magazine, which has a readership of 8.1 million, has been the leading source of cutting-edge information relating to every area of African-American women’s lives. Additional information about ECI and ESSENCE is available at www.essence.com.